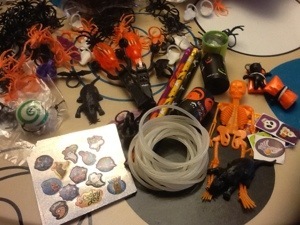 October | 2012 | ARTZCOOL'S BLOG! At work tomorrow, we are having a potluck lunch. And with this miserable, rainy weather we have been having for the last week, I have been really tired! 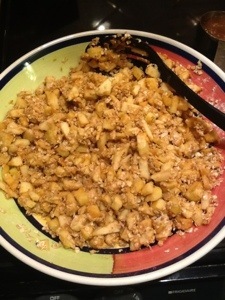 So, when I signed up, I signed up for a meat dish…and as of this afternoon, I had no idea what to make. 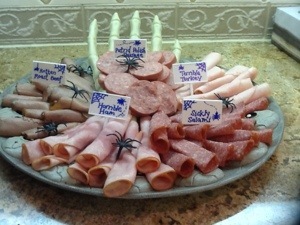 I searched on line and found a couple really gross meat dishes like baked rat, and a severed head made out of meat, but I thought they were a little gross… And took a lot of time and energy… So I thought of a much easier idea! 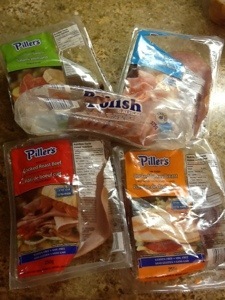 I bought a selection of cold cuts, like turkey, ham, roast beef, salami and polish sausage. 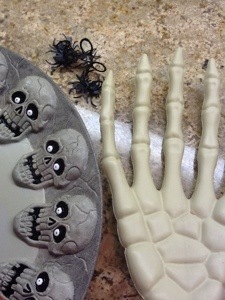 I dug through my halloween decorations and found a fancy spooky platter, a severed hand, and a few spiders, and washed them thoroughly…. 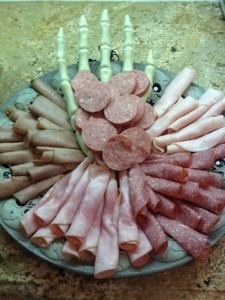 I put the hand on the bottom, and cut up polish sausage on top, then I rolled the slices of meat and placed them on the tray. I thought it turned out pretty well, and the best part is now I am sitting on the couch relaxing after dinner, rather than cooking! I LOVE Halloween! 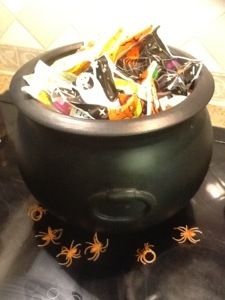 I love the decorating, dressing up, and of course, I love the candy! 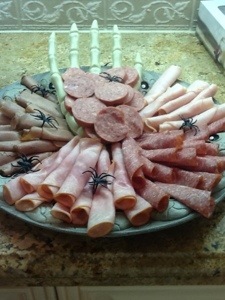 But, I have really been trying to cut down on our candy intake. It is really hard when the kids end up with bags and bags of candy… And when we have left over candy from handing out on top of that! 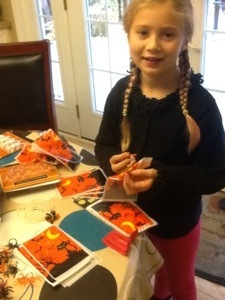 Because it was after Halloween, all of the stuff was 50-75 percent off, so it was much cheaper than candy. 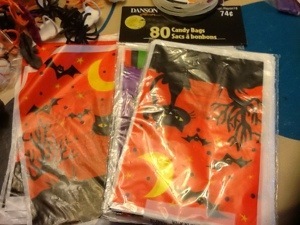 I also bought some little Halloween bags. Basically, I put three little thing in each bag than taped the top of the bag closed. Of course, I had help! We ended up making over 100 bags, but the best part is whatever we don’t use, we can toss into a box and use next year, and, I won’t eat the leftovers! Yahoo, I just checked the stats for my blog, and http://www.artzcool.net has now had over 20,000 views!! Wow! Still not enough to quit my day job (or even pay for my groceries…) but still… 20,000 views! Thanks for reading, and share the link with everyone you know! Once in a while, my fashion design degree actually comes in handy. I find that on Halloween especially, I actually end up using some of the skills I paid tens of thousands of dollars for. 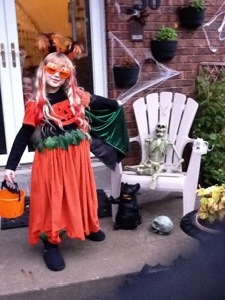 I have talked before about how my kids have very specific requests about the kinds of things they imagine, which i think is great…Here is Samantha’s costume last year…she wanted to be a combination of a pumpkin, Cinderella, and a super hero! So we came up with Super-Cinder-pumpkin-Ella…. 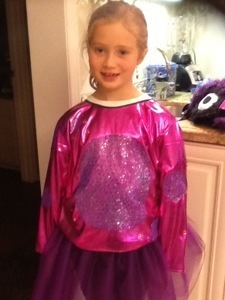 This year, she wants to be a magic monster… Yeah I know. 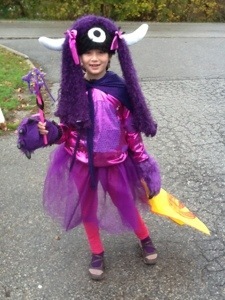 But… The monster is also a girl, has to have long purple hair, and a horn and one eye…. 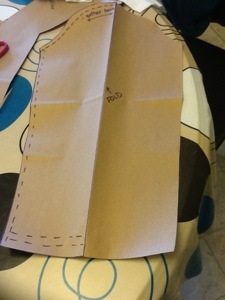 Little did I ever think in university that I would be drafting a pattern for my daughter to be a girl, magic monster! Anyways, we went to fabricland and value village and picked up a few odds and ends. 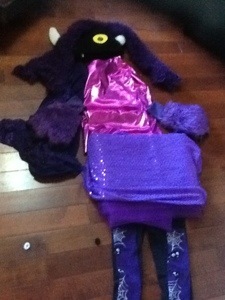 A black furry hat with horns, a few different sparkly fabrics, some tulle for a tutu and some purple Halloween socks. 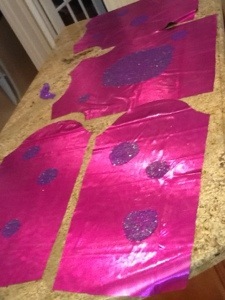 The first step in making a costume was to make the body. So I thought it would be easiest to start with a shirt we already have. 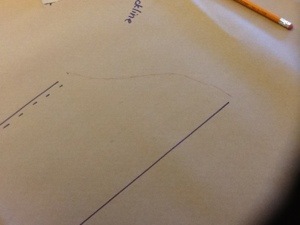 I laid the shirt flat on a big piece of brown paper, and traced down the sides. I do want the shirt a little bigger as she might be wearing a shirt or sweater under it. 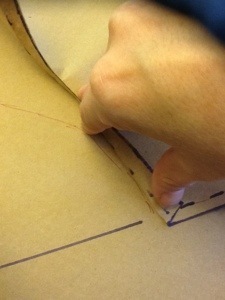 Then, I added enough for the seams, with a dotted line. 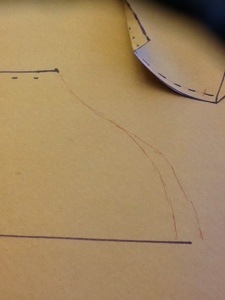 Then, I marked the shoulder line, and folded the arm of the shirt back so I could trace the approximate shape of the armhole. 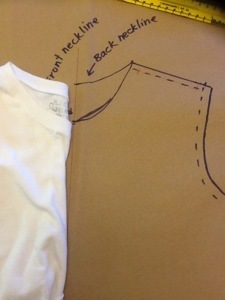 Then, I added the neckline. 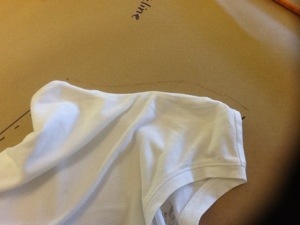 Note that I am only drafting half of the shirt. There’s no point in doing the two sides, because it is almost impossible to make them the same. 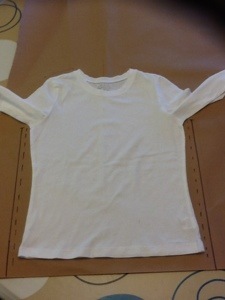 If you do want the pattern to be the whole shirt front, fold the paper and cut out both sides together when it is folded. 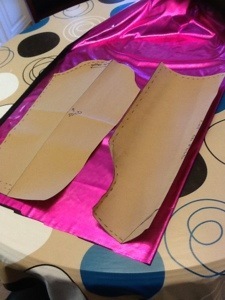 I also use the same piece for the front and back, I will just cut out a little more neck for the front. 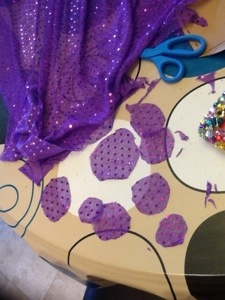 For the purpose of this costume, I am going to use the same pattern piece for the front and back. If this was a really fitted piece, you might want to draft the front and back separately. 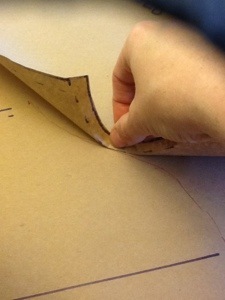 Now for the arms…flatten the arm out and trace the sides. 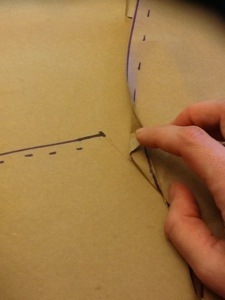 I am not going to add a seam on the top of the arm, because it will be cut on the fold. 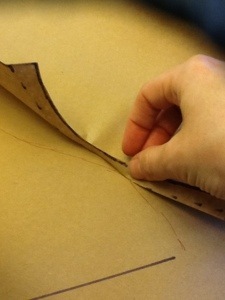 And, I added extra to the cuff of the sleeve so I would be able to roll it under to finish it. 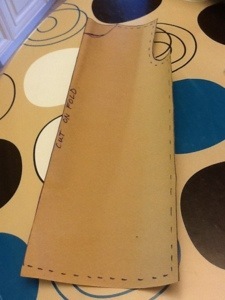 Now for the tricky part, the cap for the sleeve. 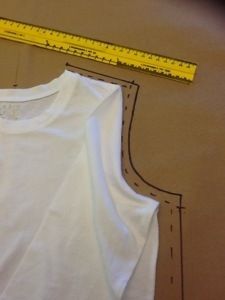 I kept lifting the shirt up then laying it back down to sketch a rough line of the armhole. 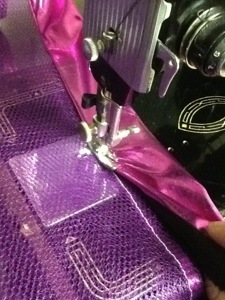 Then I lay it on the cap of the sleeve and rotate it on the stitching line to see if it fits. 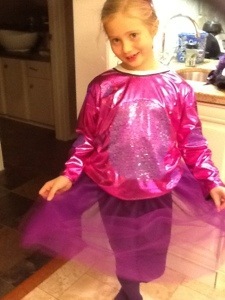 But, because it is a costume, I think it’s better if I have a little more room, so I am going to gather it a little. 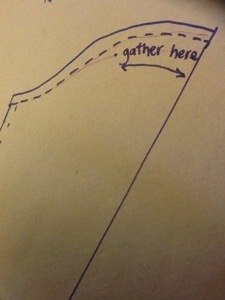 So I drew a dotted line where it will be stitched, and then drew a solid line where I will cut. 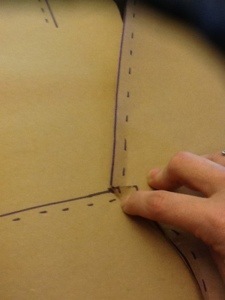 Here is how I extend the pattern piece so it is a full piece and I don’t have to cut on the fold of the fabric. 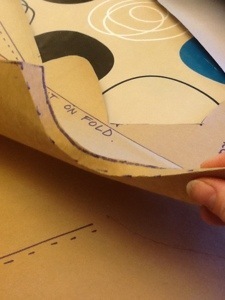 I fold the paper on the fold line then cut around. Time to get out the fabric. 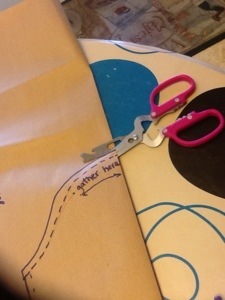 Lay the pieces on the fabric, pin, and cut out. This year, for Halloween, my daughter, Samantha wants to be a “magic monster with super powers” so, because this magic monster is a girl, she needs to be wearing a dress, right? 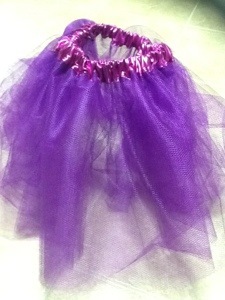 So if it’s going to be a dress, it might as well be a tutu, right? 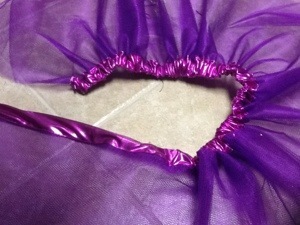 So, here’s how I made the tutu for the super monster… I figured I would post it because the same method, or steps can also make regular ballerina tutus, or a witches tutu…the possibilities are endless! 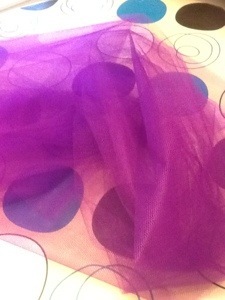 The tulle is pretty wide. 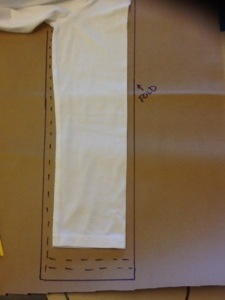 For the length for Sam, I figured I could fold it lengthwise to make five layers. 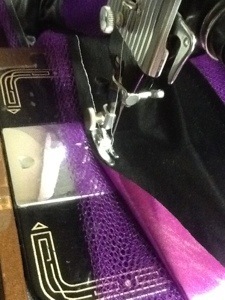 I have tried using pins with tulle before, and it is really frustrating, so I would recommend using safety pins. 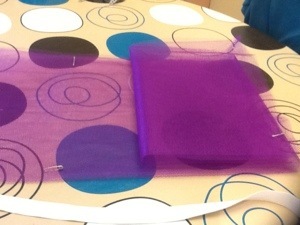 I folded the tulle into five layers, and used a safety pin every couple feet to hold it in place. To make it comfortable, because the tulle is quite itchy against the skin, I made the waist band out of the shiny fabric I am using to make a matching top. 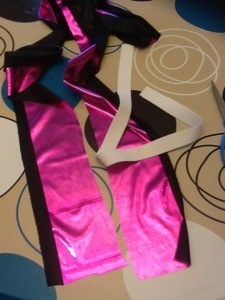 So, I cut a two metre strip of the shiny fabric, and I cut an elastic to fit Samantha’s waist. 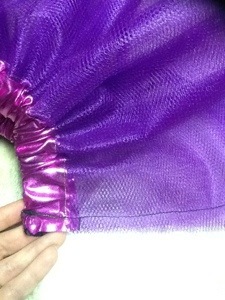 To attach the waistband, I first sewed the shiny fabric to the tulle, right sides in. 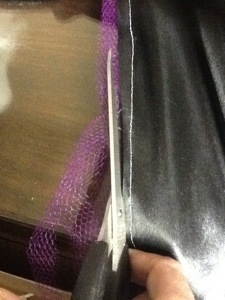 Then I clipped the excess fabric and tulle close to the seam.. The magic monster comes alive! 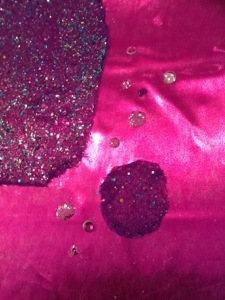 In a couple posts I wrote last week, I drafted the pattern for my daughter’s magic monster shirt, and I sewed the tutu. I wanted to share with you how I decorated the shirt to make it look more like the skin of a monster, and the rest of the costume. 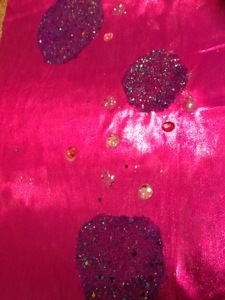 Sam and I had picked out this really cool sparkly fabric when were were fabric shopping, but of course I had no idea how we were going to use it because it was so sheer and thin. We decided that it would be cool to cut out a bunch of circles, and use it as texture for the monsters skin. Sam had a vision for the monsters head.. She wanted two horns, so we started with a furry Viking hat, then we cut out, and hand stitched an eye in the middle of the head. For the hair, we used a fluffy scarf I had, and finally we added a couple bows made from left over fabric from the shirt. Anyone who knows me knows that I have always had a bit of an obsession with candy. I could live without chocolate, or ice cream, but not candy. So I do like to try out new recipes when I find them. 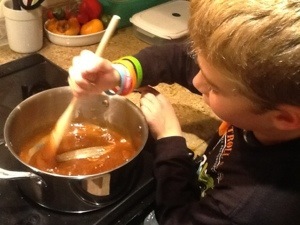 Today, the kids and I are going to try making homemade caramels. 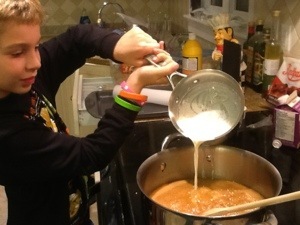 Honey, brown sugar, corn syrup, vanilla, butter, table cream, and coarse salt. 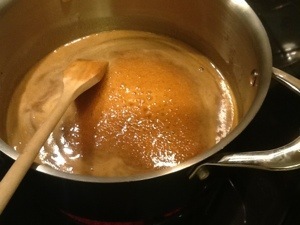 The first step is to mix 1 cup of brown sugar, 1/2 cup of corn syrup, 1/2 cup of honey and 1 tbsp of vanilla extract in a big pot. 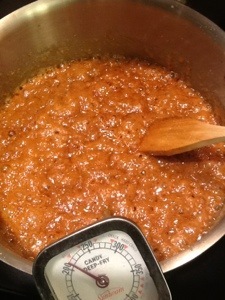 As it boils, it changes colour and consistency…. 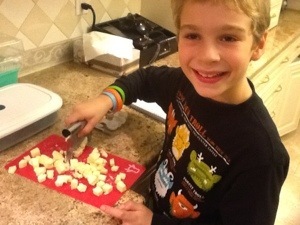 While you are waiting, cut the butter up into small cubes…great job for your helpers! 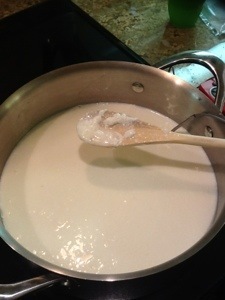 In a separate pot, heat a cup of cream to a simmer. 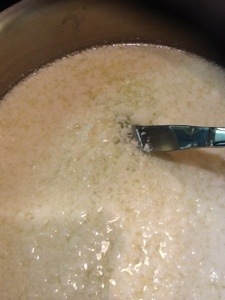 Then, melt the butter by adding it to the boiling sugar mixture. 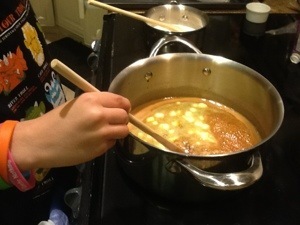 Then let it boil until it reaches 260 degrees. Or the hard ball stage. Let it sit in the pot for a couple minutes. 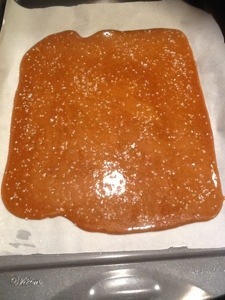 Then, pour onto cookie a sheet lined with wax paper. Wait a few minutes and sprinkle with salt. I used coarse salt, trust me, the salt is the best part! 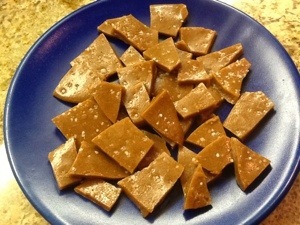 Then, once it has cooled, crack it into pieces. Yummy! My advice is to be careful when storing. I don’t think I let the temperature get quite high enough because if I stack these on top of each other, like in the picture, they end up being a solid piece. 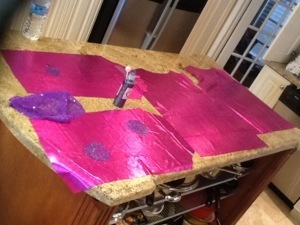 So, I have to put wax paper in between layers. But, they taste delicious! 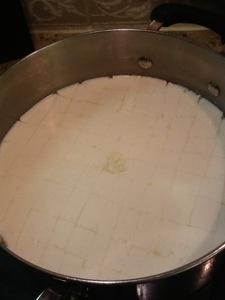 But, my excuse is that I was trying to cook dinner at the same time… My advice to you is that multi-tasking while cheese making…not a good idea. 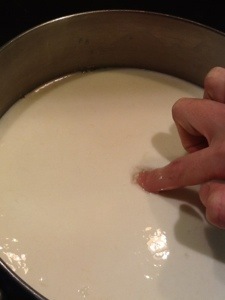 I learned to heat the milk slowly, and if you leave it too long, and the temperature goes too high, that is not a good thing. 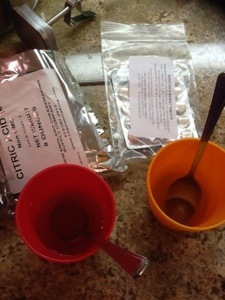 Before I started heating the milk this time, I prepared things ahead of time, I mixed 1/2 tablet of rennet with a few tablespoons of bottled water, and in a separate cup/bowl, I mixed 1 tsp of the citric acid with a few tablespoons of bottled water. Apparently you are supposed to use nonchlorinated water, so bottled water was the closest I could find. I put both the mixtures aside. 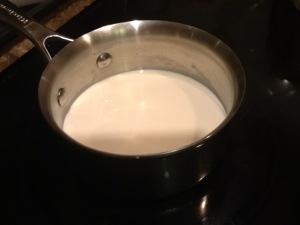 I poured all of the milk into a stainless steel pot, and SLOWLY heated it to 80 degrees. I had the stove on set on 2, so I didn’t repeat my mistake of heating it too high. 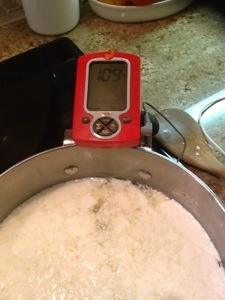 I used a meat thermometer to measure the temperature. 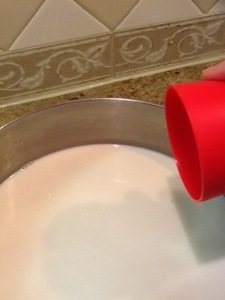 Once the milk reached 80 degrees, I took off the heat, and added the mixture of water and citric acid, stir, than added another teaspoon of citric acid. 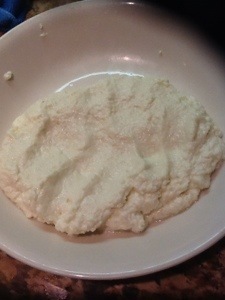 It curdled or thickened almost instantly. 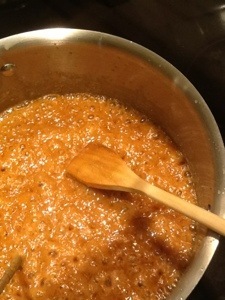 Then, I put it back on the heat to 90 and added the rennet mixture. 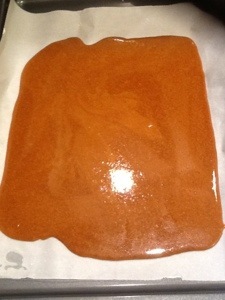 Stirred a couple times, then let it sit. You should leave it for about for 20 minutes, I rushed it a little and waited more like 10 minutes…getting close to bed time! 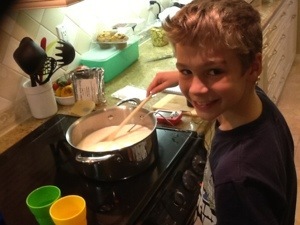 So now it’s time for the kids favourite part… Time to cut the cheese! Yeah! Now that looks more like the picture! 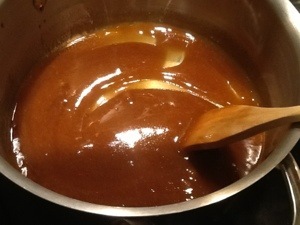 I poured the mixture into a fine strainer. 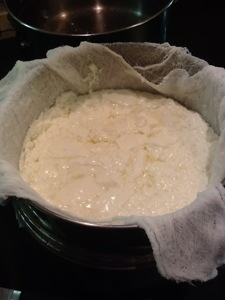 I used a strainer lined with a cheese cloth. 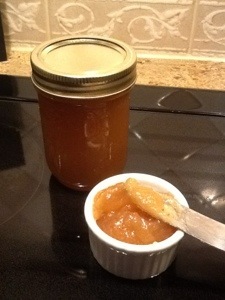 So, by this time, it was time to put the kids to bed, so I left it to strain for about 1/2 hour. I added a little salt to taste at this point too. So it still wasn’t the texture of mozzarella cheese and i started to panic a little, but when I looked back at the instructions it said to do the following. 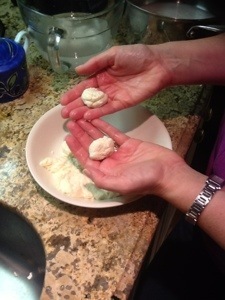 To make the cheese stretchy, heat up in microwave for 30 to 45 seconds at a time, depending on how hot your microwave is. 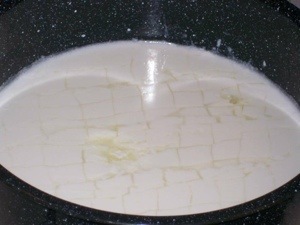 When you take it out, squeeze out the excess water, drain and repeat. I repeated this numerous times, and I burned my fingers numerous times too! 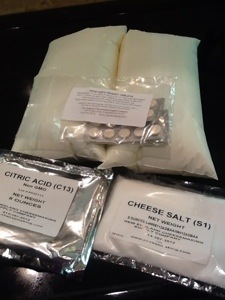 If I ever do make cheese again, I will use gloves. 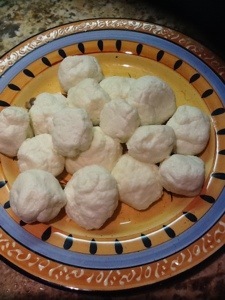 Normally, mozzarella is stretched and formed into larger balls, but I decided to make smaller balls, to make them easier to serve and store. I thought they would be great for lunches. 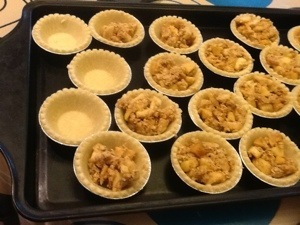 So I stretched them a little and then formed small balls. They tasted really good! 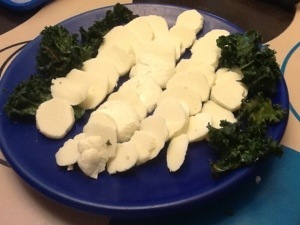 The mozzarella had a different taste that store bought mozzarella, which I liked, but I was a little disappointed at the quantity of cheese that it made. 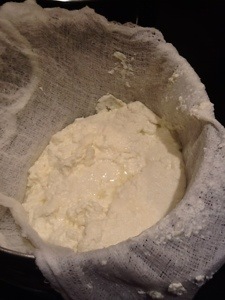 I thought it would make a lot more, but a four litre bag of milk would only make a couple cups of cheese (if they turned out right!) So it turned out being about the same cost as store bought cheese. I might consider making it again for a special occasion, but probably not for a while. If anyone wants to try it out and needs a rennet tablet, I have a few extra! You know how sometimes food tastes better when someone else has made it? 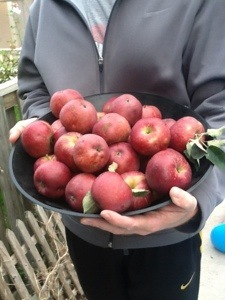 Well, I think these apples taste better just because we didn’t actually grow them…again, I would like to thank our neighbors for their delicious apples which hung over on our side of the fence! 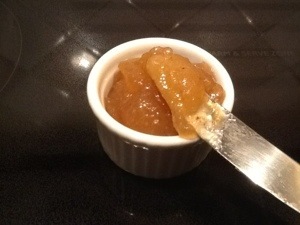 After I made apple crisp, I still had about five cups of slice apples left over, so I decided to try making apple butter. 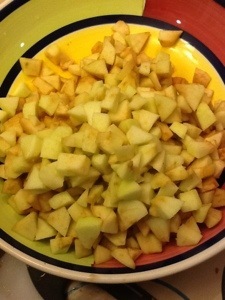 Basically, I put the apples into a saucepan, added a cup of apple juice, a teaspoon of cinnamon, and 4 cups of sugar. 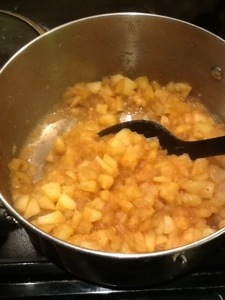 I cooked it for about 1/2 hour, until the apples were really mushy. 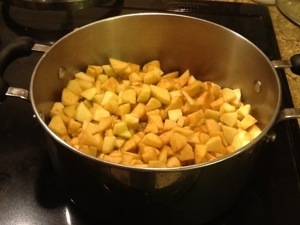 I have seen quite a few recipes that boil the apples all day, but I was on a time limit! 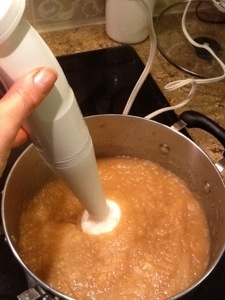 Then I used the blender stick thing (sorry, can remember what you call them) to purée the apples. 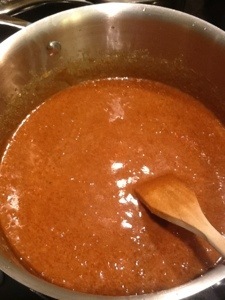 I let it boil for a few more minutes, and then poured them into my hot sterilized jars. 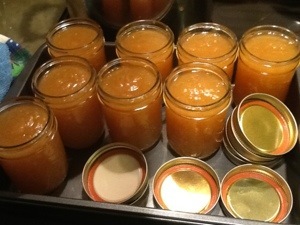 It ended up making 9 jars. 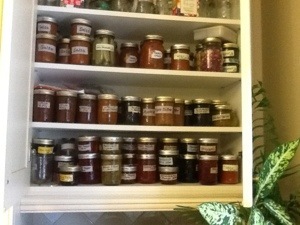 I now have a pretty stocked jam cupboard, ready for Christmas gifts! I just need to order some labels. I have been using masking tape so far. Once again, we are the lucky recipients of some good stuff growing over our side of the fence, thank you again to our neighbours! In the summer, we got their beautiful roses, and now, we have an abundance of apples, just hanging over our side of the fence, just waiting to be picked. 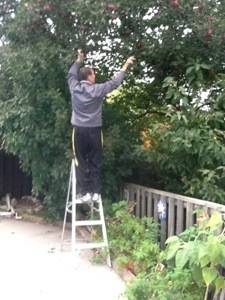 So, I had my wonderful husband climb up a ladder yesterday to pick some of the fruits of their labour…apples. 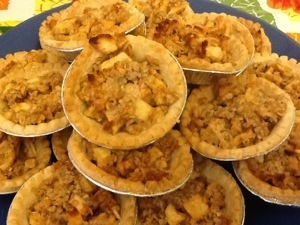 Then I dug around in the freezer because I thought I had a couple pie shells, but all I could find was the mini pie shells. So, I scooped about a tablespoon into each one. Then, cooked them at 350 degrees for about 20 minutes. 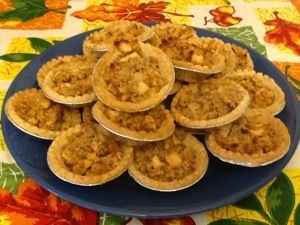 The problem was that I still had about 5 cups of apples left! 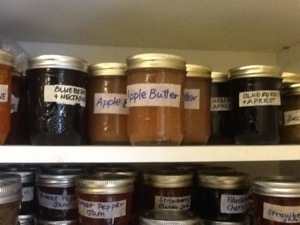 So, I looked on line and found a few recipes for apple butter. 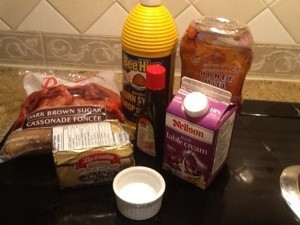 I will post the recipe once I have a chance.